"The first part of building a house is the excavation...We hired Audet to excavate and provide site services for our new house. We worked with Sean and Dan for a period of a year and a half getting to know them as the project progressed. Working with a firm that was knowledgeable both in the excavation business as well as the landscape really worked for us"
Creating a responsible balance between a clients wants and needs is our priority. Whether it is designing a landscape working hand in hand with the client, or working with a landscape architect or designer, our knowledge on current products and innovations allows for traditional and contemporary landscapes to be completely in balance. Our belief is that landscape construction needs to be well planned and treated in the same regard as any interior renovation in your house. 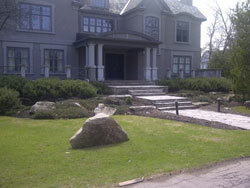 Your outdoor sitting area is more than a patio, its your outdoor living space, your outdoor room if you will. 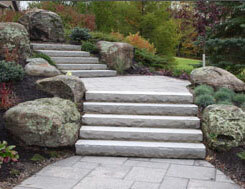 Landscapes evolve and mature over time, when function and aesthetics are in balance, a lasting landscape can be created. Having been created as a spearate arm of Audet & Associates in 2000, this segment of the company has realized steady growth in the last decade. Initially specializing in limited access and confined space excavations, as demand grew for our services, so did our fleet of equipment. With specialized equipment ranging in size from 42" in width, to excavators and earth movers over 12 feet wide, we continue to be industry leaders in the segment. Excavation services from the simplest of additions to the most complex foundations are completed using all in-house equipment. Experienced knowledge and supervision facilitate keep your project on time. 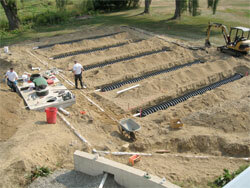 Septic system installation and repair is a major component of our firm. New septic systems and replacement systems are installed weekly. We are certified installers of most tertiary systems and have experience installing a large number of systems locally.